I have long had misgivings about "conservative" talk radio. I still listen, although less now than before, because I need to know of news that I won't hear from Sinister-Wing Media, but also because I need to know what bad stuff might be said there that could redound to harm our cause for what is right. Let the following serve as another warning about Michael Medved in particular, and his radio network, Salem Broadcasting, in general. McCain at a bit past 3 PM EST, on the Medved show, being offered the opportunity to comment on Obama’s “I am not a Bolshevik” said it reminded him of Nixon’s “I am not a crook.” He avoided further comment. John “no, he’s a nice man” McCain said it. Obama also made the Nixonian declaration, “I am not an ideologue”. This is an awful mistake, as it is so readily shown to be a lie. Thanks for setting the record staight. I was wondering why “I am not a Bolshevik” did not come up with a recent hit. Now I know. I took your clue and changed the search to “I am not an Ideologue” and got many hits. I listen to Medved primarily to discover in what manner this “former” Leftist agit-proper will next undermine our cause. That could have been the source of Medved’s mangled quote. Still, this misquote of Obama to McCain was how Medved opened his show, and given his history in agit-prop, well… YMMV. You can be sure that Media Matters will hammer us over it while ignoring the true quote which is nearly as damning. When my first comment was remembered and later repeated by others on the thread, it greatly saddened me. It means few read my follow-up and remembered the inaccurate report (probably because first one was closer to what the reader wanted to hear). Thus I felt compelled to write additionally about the experience here, on my blog. As I noted above, a few minutes after I'd heard Medved, I could not find the phrase "I am not a Bolshevik" on the web that was not years old. John McCain, formerly the MSM's favorite maverick/moderate, was on the Medved show, and being offered the opportunity to comment on Obama’s “I am not a Bolshevik” said it reminded him of Nixon’s “I am not a crook.” He declined further comment. Yes, he changed avoided to declined, but every other word was identical. And I am grateful for his oversight since “I am not a Bolshevik” is inaccurate. Anyway, the Sinister-Wing takes advantage of every error by us, even when a good faith effort is made to correct the record. Bottom line: Michael Medved provided misinformation. There is a possibility he is providing disinformation. Be extra skeptical when he says something. PSB Day 9 - Where is Tort Reformed Healthcare? Well, now for some good news. You missed the president's comments on tort reform last eve? You must have nodded off when he swore allegiance to the trial attorneys. No one feels the pain of the unfair system more than physicians like me. For a physicians viewpoint, see [my blog] under Legal Quality. I have read some of it doctor. So far I've not seen it all, so I am holding off judgment. Many of my concerns are the same as yours, but the system is being encumbered by the worst sorts of human beings, some -- but not all -- for the worst of reasons. The only way to really set you and all good physicians free is to counteract the anti-human agenda that has been adopted by so many Ivory Tower policy designers. When more people start discussing that reality, only then will those like you stand a chance of prevailing. What do I need to show you to convince you of that? It is nine (9) days PSB. Nine days post Scott Brown. And you really thought that marked the end of the radical agenda? Hm. Tort reform with or without ABA support? AMA reforms that vastly reduce the need for litigation? Kill the beastly cycle of cost increases that begins feeding itself due to the specter of law suits. What? You say you can't read the five lines of text above? Well its condition reflects reality. The likelihood that our institutions of health care will see the most meaningful of reforms have all but faded away. We can dream, can't we? PSB Day 8 - Where is Tort Reformed Healthcare? "The approach we’ve taken would protect every American from the worst practices of the insurance industry." Gee, somehow he never touched the issue of tort reform at all. (Insert your sarcasm if you got some). It is eight (8) days PSB. Eight days post Scott Brown. And you really thought that marked the end of the radical agenda? Hm. The likelihood that our institutions of health care will see the most meaningful of reforms have shrunk even more. It will take you shoving your opinion down your "representatives" throats, or they will ram HR3200 up your hind quarters. What I mean by Pascal Fervor is suggested just below my masthead. Blaise Pascal disliked those who destroyed things and especially people he thought good. They so aroused his ire that he dedicated his genius to defeating them. I, your humble commentator, call that sort of dedication "Pascal Fervor." I've tried to take clues from Pascal so as to move somewhat in the manner he did. However, lacking his genius and position of influence, my efforts to overturn those forces that would destroy the American Dream may not be anywhere near so successful. As a result, I sometimes call myself Pascal (the derivative.) That is, I have endeavored simply to move in the direction to which he was pointing. This short explanation is now a single paragraph at the top of the broad review of this blog: Synopsis of Pascal Fervor. PSB Day 7 - Where is Tort Reformed Healthcare? So: Because Sinister Media has been reporting that ObumaCare is dead, you think the threat to your health has ended? It is seven (7) days PSB. Seven days post Scott Brown. The likelihood that our institutions of health care will see meaningful reforms are fading and shrinking daily. The biggest winners are still 1) trial lawyers, 2) insurance companies (for now), and 3) Republican complacency. As long as the system continues to move as it has been moving, more people will find they are being forced to pay for those who exploit the system as it now operates. That guarantees that this issue will erupt again in future UNLESS the two primary issues identified up above -- in suitably fading smaller print -- are tackled. The next time Jason the Statists may win. Is that okay with you, ever? Our leaders are too subject to the influence of the big money gamers of the current health care system. They will not lead unless the continually hear from you. Dear Congressional representatives, allow all your constituents to continue to protect their very lives to the extent they are able. Limit court awards to actual costs and no more than double penalties. Demand the AMA stop limiting the number of Med schools and students. Demand the AMA stop acting like a guild and more like a professional organization that defends and enforces the Hippocratic Oath. Saturday I flew over Southeastern California from the Colorado River to the Los Angeles basin. Sorry, but I did not have my camera with me, so you will just have to take my word for it until someone else posts a picture or two. The first indication I had of what I was about to see came when the pilot announced that "a very unusual site was coming up outside our windows. The desert mountains are covered with snow." Then I saw some closer mountains with white peaks. This was still East of Indio. And then I noticed that there was a high plain that was completely white, surrounded on three sides by ridges maybe a thousand feet higher. To the south of this high plains desert was a gradual slope down maybe another 1000 feet to another plain that lacked the snow cover. And that was when I noticed the biggest change. Every time I had flown over this stretch it had the appearance of a dusty yellow/tan. This time is was widely brown. The ground was that soaked. This is the California desert. And it was WET. Wetter than I've ever seen it in 40 years of flying over it. Everywhere that it is normally dull pastel it was now rich brown. Wet, wet, wet! I hope you people in the Mid-West and back East are ready for what we got out here. Oh, and we have more storms scheduled for the coming week. And I hope you all are happy that Al Gore is keeping warm and out of sight and paying himself carbon-credits so's he can keep his Tennessee mansions warm so that his pipes don't freeze while he's out flying jets around the world pushing his warmist agenda. PSB Day 6 - Where is Tort Reformed Healthcare? So: maybe you thought the threat to your health had ended? It is six (6) days PSB. Six days post Scott Brown. 1. Tort reform with or without ABA support? 2. AMA reforms that vastly reduce the need for litigation? A great many on the Right still seem pretty confident that Massachusetts electing a Republican Senator means the end of ObumaCare. Yet the likelihood that our institutions of health care will get meaningful reforms are fading daily as the discussions have not turned in that direction. I received a bit of a shock this week when an activity that is properly reserved for private was being engaged in public. When seeking a way to describe it, the easiest way was to say it was a staged 66. I think it was agitprop provocation (I hope that combination isn't a redundancy) aimed at harming the establishment it was being staged in. No witness directly confronted the pair which may have disappointed them. The facility management is now aware of the tactic and that they may be targets. Later, that got me to thinking one step further. I did a google search for "the Mark of the Beast" and "Lucky Pierre." I came up with nothing directly connecting the two despite them sharing the same abstract symbolism. I find it startling that the similarity of these two symbols have gone unremarked, particularly by the religious community. Our institutions, religious too, are that PC? PSB Day 5 - Where is Tort Reformed Healthcare? It is five (5) days PSB. Five days post Scott Brown. You KNOW the people who dreamed up the stuff buried in HR3200 and exposed by page and line in the following video are not going away that easily. Uh... Don't you? PSB Day 4 - Where is Tort Reformed Healthcare? It is four (4) days PSB. Four days post Scott Brown. Mark Alger made a short post on Wednesday that I just noticed. TO THE DEVIL a long time ago -- pace Glenn Beck, who Tuesday said that the soul of the Democrat Party is up for grabs. I don't see the so-called Progressives yielding up their stranglehold on power within the party. I see them destroying it as a viable force in politics before they let that happen. Somehow my friend overlooked the presence of the so-called Progressives in the Republican Party. The "if I can't have it, nobody will" is a form of covetousness as old as mankind. Didn't that guy Shakespeare write of it at least once? One character of which I am thinking: his name nearly spells out the problem at root. Let alone the Dems; I am willing to bet that you’d settle for the nation recognizing how the so-called Progressives within the GOP have bent it and then do what is necessary to end "Progressive" influence. Incrementals in the nominally anti-Statist party unnecessary. We accomplish that, and the Dem party will expel them on their own (right after they cleanse themselves of radicals) just to stay in the game. The Incrementals have been whittling away on our republic for most of the 20th Century. Our best guess is that got impatient and permitted the radicals to take over the legislative and executive branches. Don't like Americans? Light your beacons, set you blazes, and lead from behind! That links to the Washington Post. At another time, not long ago, this story would lack credibility and the WaPo would have suppressed the story whether it was or not. I don't rightly know whether to laugh or cry. And I'm uncomfortable saying so. When one can be literally torn between laughing and crying, and it sounds so odd, does that mean that an honest mixed emotion has become cliché? When our very emotions may seem cliché, how far can we be from bottom? PSB Day 3 - Where is Tort Reformed Healthcare? It is three (3) days PSB. Three days post Scott Brown, and yes, yesterday we heard reduced talk of the ObumaCare juggernaut. Could that be because Pelosi said she lacked the votes to force the Senate version on us. Now expect Sinister Media will go relatively silent. The Incrementals and Sinister Wingers regroup. What was direly important before (ante) Scott Brown (ASB) is now, PSB, just another stalled siege of an American rampart. But for millions of Americans, inadequate healthcare remians an issue. The price for seeing a doctor about non-emergency ailments is exorbitantly high. It got that way because of the high costs related to legal fees made necessary by the stonewalls erected by the AMA. And now that insurance companies are in the game, and have their own necks to protect, the largest of these -- like AARP -- have turned to the law to give them an edge over the less well-connected. Hence, the vile sausage known as Obumacare was molded, and Congress tried to stuff it down our throats. PSB it's been puked back out all over Reid and Pelosi while Obama acts as if he only got a few splatters. Maybe. Anyway, the siege on the ramparts which protect you from the John Holdren's of the world has ceased for now. Which institutional rampart will the radical's concentrate on next? Banks? Wall Street in general? We'll know soon enough. 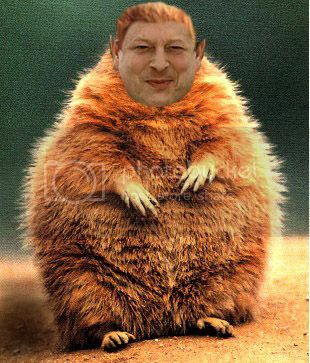 Let's not forget our annual need to boost this critter from his hiding place on February 2nd. Warm(?) memories of this day will make the summer months so much more tolerable. That will be when Sinister media most breathlessly again promotes the varmint's agenda. PSB Day 2 - Where is Tort Reformed Healthcare? It is two (2) days PSB. Kill the beastly cycle of cost increases that feeds itself due to the specter of law suits. PSB Day 1- Where is Tort Reformed Healthcare? PSB is my acronym for what potentially could be a new political era ushered in by last night's landmark election of a Republican to be Massachusetts' representative in the United States Senate. This is the Post Scott Brown era. Agreed, this is only day one since the warning was sent to the Incrementals and Sinister Wingers. However, this will be repeated daily as needed. The “make concessions to aggression” conditioning, to which I referred in Deprogramming, occurred in NYC public schools from 1951-59. It would aid my model building to know approximately how many others have endured similar treatment or wound up finding another way out of the programming. The reason I ask is I suspect the majority of my readers either never had to endure such conditioning or have already outgrown it to some extent. As a result they essentially are sufferers of a form of Stockholm syndrome under the thumb of urban ruling machines. They view conservatives as those who’ll upset their world as they think it must be. For instance, Peter Boston’s experience recounted at 136 matches my own with those friends and family who remained in the East. One of the reasons I run by you ideas for new ways of saying things is I am always seeking words that will break barriers. I constantly try to break off more of the sheeple from the herd. I’ve had remarkably good success on one-on-one bases. But it is a terribly slow process. And, don’t forget, I live in the heart of a Mexican-American area of Los Angeles (with a Marxist congresscritter in CA31 who was sought for the office by white Marxists (disguised as liberals) because he was Latino, and a gang-member/ACLU mayor who is there in large part due to aid from the same extreme-Left white forces). In order to gain ground on way-laying the Statists and other Sinister Wing forces from stealing votes in the future, we must find ways to heal more urbanites of their Stockholm Syndrome. They need help to recognize why their best long-term interests are served when big city machines are defeated in diluting the voices of legitimate voters. Hence the reason for this additional post. How many of you experienced similar conditioning in school? How did you break free? For those who never endured or succumbed to it: how did your parents manage to protect you from it? (In this, I had pretty good success with my kids, but much of it had to do with showing up, applying pressure, being willing to move and having some good luck). What follows is an amalgam of responses in the thread Double Down at the Belmont club. I’ve finally won the global warming argument with 3 “true believer” relatives. That's 2 extended family members better than me on AGW. Congratulations. It took years of them believing I was a whacko and then climategate and then a really cold winter they could see before they finally lost the faith. 1 of them actually switched and will say he doesn’t believe it any more, the 2 woman simply say they never want to hear anything about global warming either way ever again. But since they used to preach the evils of what mankind was doing to the planet, that’s as good as a win in my book. And of course there’s the biggest benefit is that if I can break their belief in one thing the snake oil peddlers are selling, I have gone a long way towards breaking their beliefs in *everything* the snake oil peddlers are selling. Normally good advice, but hell, don't tell a man on the front lines to retreat unless it's time to surrender. After I hope I suppressed an eye-roll, I lacked time needed to get him then to concede the two issues are not the same. What he’d done was casually switched the argument to the old demagogic sophistry that liberals like clean air and conservatives like filth -- quite symptomatic of his state sponsored Incremental programming. Your two women may have done something similar, only they didn’t let on to you (cuz they didn’t wanna talk anymore). IOW, you may still need to sonar for that evasion (delicately) to sustain your success. One of the reasons urbanites, even those in the middle class, vote in large numbers for the Left really seems to be something akin to Stockholm syndrome. The urbanite still believes s/he's liberal even as his candidates are openly fascist, or conservative and his candidates prove to be worse than merely spineless. Demonstrated inconsistency are met with everything from shifts in subject to violent denials, and only conceded in the manner you describe -- "I don't want to talk about it!" Voter fraud is close to a sacrament here, committed by radicals who use illegal aliens, protected by Incrementals who claim any crackdown is racist (Dems) or could appear to be (GOP). Nobody should forget how over-the-top both Schwarzenegger and GWBush reacted to the Orange County GOP candidate who ran against Loretta Sanchez's voter roll padding. We will never get a super-majority of any sort of conservative movement as long as the Sinisters can steal enough congressional seats to form a troublesome bloc. What is that [Proper name] rule that any institution not conservatively anchored must eventually turn Left? Giving up on large areas of the country WILL sustain that rule for sure, and today's win will be but another forestalling of the inevitable end of this great republic. Wow, what a difference a couple of generations make! ...well-behaved population wise to what was going on and the efforts the Allies were making to keep them free. ...not even a week old, and already people are raising Cain about American and NGO inability to have the rescue and cleanup done already. With 1 above, the Allies in 1945 found pleasure not just in thwarting what would eventually be labeled "The Evil Empire," but in knowing they had preserved the freedom for the residents of one war-devastated and politically isolated city. But what exactly is in the mind of today's Postmodernist world leaders in 2 above? Well, as all rescue efforts are on-going, they provide us with 24/7 newscasts that mock the efforts of the rescuers whilst airing heckling from the sidelines. Chavezoids are tossing incendiary comments which gets full coverage as if someone important had leveled charges. Sufficiently annoyed by this current spectacle, it hit upon me that what is happening in Haiti is the Postmodernist nightmare our Incrementals would visit upon us all. Sinister Media is secretly getting off on this. They’re threatening us with what is their masters’ aim for postmodernity (that’s the future they wish on all humanity). They’ll gladly provide a Satanic leer at your request. God but the Incrementals are long past ripe, aren’t they? For you see I have begun to suspect that a primary reason our would-be übermenschen love this sort of event is that they have found a way for human suffering to heighten their sexual release. In what sort of pickle will we find ourselves when they discover that small scale disasters no longer deliver the perverse kick they crave? Recall grade-school discipline. Being sent to the principal's office for fighting. The instigator's laughed because their victim received the same punishment as them. The bully would beat on you and then the authority would punish you both equally. I saw it happen even to kids who didn't fight back. Principal "I don't care who started it" always behaved the same. Did you ever think back then that the bully was actually an agent of the principal? It never occurred to me. Junior High School was even worse. Moving between classes meant that new-comers were open game to older, larger bullies they never met before. I was in the dean's office the first week of classes subjected to the same game. I felt stuck between the proverbial rock and a hard place. Here was authority that not only failed to protect the innocent from the guilty, it too was loath to determine who was at fault. It treated both offender and offended equally; the offenders laughed. The message being drilled into victims was "better to accept some abuse than get caught in a fight." And still it never occurred to me that the bully was the agent of the authorities. I bring this up because the behavior of homeland security today brings to mind so much of those jr. high days of 50 years ago. The behavior of those behind the politically cowardizing movement of the last two dozen years have incrementally brought that form of institutionalized victimization to society as a whole. I am betting you are ready for someone to tell you that the system's programming was dead wrong. Those in charge owe you not only a reform of the institution of public protection, they owe you, at the very least, a big apology. The mavens of public policy should beg your forgiveness, especially where you have lost loved ones and liberty due to their treating criminals leniently (and now intend to treat terrorists the same way). All that due to the fake "Progressive" agenda of the power grubbing Incrementals. So, yes -- you do have good reason to suspect that "the agents of change" are using the terrorists much as the school system makes use of bullies. Tell me you are ready for deprogramming. Deprogrammed -- that is, awakened -- citizens are the Incrementals' worst nightmare. For each of you willing to admit they have been cowed a little, there are dozens more you know who are waiting for you or some other, very likely a demagogue, to tell them their anger is justified. Mass deprogramming is just around the corner. Help it to gradually emerge or run the risk of being trampled by a stampede. The established order is losing its grip and adults need to be ready to lead. Understand me. They'd steal candy from a baby and they will steal your voice in government. Weak though it be, they will steal what they scornfully call your vote. "Who will stop us? The voters? Bwahahahahaha!" This morning my favorite curmudgeon highlighted the above, excerpted from Sarah Durand's column at PajamasMedia. That's been me. That's been many of you. This is America. Freedom of speech was the first right institutionalized by our Constitution's First Amendment. But starting in our school systems, the majority of us have been cowered into meek little serfs; into allowing incremental inroads that have stolen away one right after another. They who'll no longer be cowed are coming. To be most effective, they will do what they must selectively and with no fanfare. God bless them. I probably have, because Song of the South is something only early baby-boomers like myself are very familiar with anymore. That's owing a great deal to the Wonderful World of Disney in its early TV existence and that same outfit in its current PC (Politically Cowered) incarnation. Anyway, without further ado, this interchange today occurred at Free Republic. Since power in Washington D.C. is well beyond the “corruption” level, large companies representing industries that are or will soon be heavily regulated by Congress and federal bureaucrats must play both sides of the fence to ensure they have a seat a the table. This "defensive" story on regulation is a historic fantasy. Big players LOVE regulation as a way to kill off their smaller competitors. They complain about new rules the way Brer Rabbit wailed about being tossed into the brier patch. A month ago I posted two commentaries Traffic-Light Propagandist and Blowing Smoke. At Mr. Craven's request, using his pretty good index, but inadequate for my purposes, I indeed did view a good portion of his videos. By 20 December I had seen at least 30. I stopped searching for the answer to my most pressing question. because I was convinced that the answer to my question was not there. In exactly which of his over 70 videos did Mr Craven address the depopulation costs? I'm sure the world would be very interested in Mr. Craven's answer(s) to my argument that command-economic governments -- the type for which he provides succor; the type that were responsible for 100 million murders last century -- is the same kind of governments his fear mongering would visit on the globe . I find it hard to believe that Mr. Craven does not know that what he is suggesting would ultimately install a collectivist global government, fulfilling the dreams of the deadly Soviet Union. In my essay on Our State of Decay, a good portion of it revolved around my criticism of "conservative" talk show hosts. That element reignited more than one discussion I've had with friends over the years. I fear its resolve is a long way off, but pray it's not. One of these was with a very old friend in Texas. He accused me (again) of being "a conservative purist." He said a lot of things including putting words in my mouth I hadn't uttered. Most unsettling was his completely ignoring my point about incrementalism and those who use it to erode the pillars of our society. He accused me of being more upset with those who claim to be conservatives than those who I fully disagree with. He can't seem to grasp the concept that his worst enemies are the ones who seek to hide their intentions. It is as if nobody who claims to be conservative and talks likes a conservative most of the time could ever be a traitor to him and what he holds dear. The idea of betrayal is totally lost on him. The most remarkable thing about my friend is that he had been the victim of betrayal at least two times: one was personal and the other professional. Those were instances where I have good reason to believe he was quite principled and the other parties simply took advantage. Really rotten. This same man can't see reason in my warning that politicians and celebrities who claim to be conservative need to be held to standards and we should share our judgment of their performance and warn others of their treachery. Maybe this is an abject lesson as to why there is good reason to behave honorably with our neighbors on an individual basis and also to discourage others who behave dishonorably through reproof. When people are constantly being victimized like my friend, maybe only a little bit here and there, it becomes far easier for them to tolerate BIG betrayals at a distance -- such as on the national stage. Using my friend's attitude as an example, each person who becomes inured to being a victim (indoctrinated to repetitive injuries) is ready to accept such betrayals. They are more likely than you to accept erosion of our country and individual rights. And they have a vote. Want to protect your society? Protect your neighbor from yourself. Does anyone remember when MOVEON.ORG was founded? IIRC, it was during Bubba's Monica Lewinsky scandal. Well, taking a hint from this George Soros funded communist organization (hey, is GS funded and communist redundant yet? ), our media and politicians just keep on moving on. One lie after another, one scandal after another, one brazen power trip after another. Who in their right mind still believes we live in society governed by the people? We really are being ruled by the ruthless who only claim to speak for a variety of interests groups. Any individual member who shouts out "Hold on buster -- you don't speak for me!" is dealt with by ignoring them. When ignoring them doesn't work, laughing at them. When laughing at them doesn't work, criminal proceedings ensue. These are clearly not politicians in the democratic sense that they feel their interest lie with securing votes. Whatever it is they are, they are not democratic. They are moving right along imposing on us all whatever visions their financiers are telling them to impose. Anyone who still believes that communism ever was anything than a wolf-in-sheep-clothing movement has not paid attention to its long history of death dealing to the common man. And now the Reds have moved on to calling themselves Green, and the word communist is almost never heard uttered outside of history books and on this blog. Our rulers have indeed been moving right along. Strike he who's least true. You knew few view clues. about tribes in Afghanistan. I expect that you will find that Steven Pressfield's enthusiasm for his subject makes it a very enjoyable to listen to in addition to it's worth in dispelling any effete notions you may have. Being buried among a series of tiny url links in a rather long post by Papa Ray at Belmont Club, I fear many club members never saw it. I will emphasize this there. The title of this thread relates it in part to my post yesterday about Western decay. But don't get me wrong: I am not suggesting a return to tribalism as an antidote to our decline. What I am suggesting is that the tribes may outlast us if we don't begin to renew our appreciation for the fundamentals that permitted the West to advance as it has. Our state of decay is indicated to a great extent by what we are willing to put up with. I get into arguments, sometimes heated, sometimes seemingly so (friends like to bare teeth at each other simply to stay in practice) over how bad our decay has progressed. For instance, abandoning known leaders who have proven their principled stands (because the buzz is "he's good but he can't win") in favor of the less than qualified and the less trustworthy. You wind up voting for people for whom you have been relentlessly told: "because they can win." It all sort of runs afoul of the maxim "God helps those who help themselves." When you vote against the guy you trust for the guy they want, and usually that is because of their money and influence is behind their guy, the chances are very good that you've fallen for the longest running confidence racket in existence; God has nothing to do with it. So, I am directing this question of our state of decay at those who claim to be more faithful than I. If you lack faith that your principles are worth defending in the relatively few times you are faced such a choice, what can you say in your defense when you appear before Him for judgment? Well, I have one excuse in your favor. There is our news media. It is so bought that it allows into its ranks only true believers (e.g., Matthews and Olbermann) while spitting out any who it let in back when it was pretending to be fair (e.g., Stossel). The media, which really earned my label Sinister, is a constantly dissembling, disingenuous, outright lying partisan. Worse. It is worse than any political party in a system where it (being labeled the "Fourth Estate") is supposed to ride rein on politics! It has been granted access and privileges not available to ordinary citizens. And what do we find it doing most? Exploiting its access with license. It uses its luxury of time and repetition to convince large bodies of our fellow Americans that the ends they endorse justify all sorts of means. And they win recruits to steal votes and engage in many other anti-democratic activities of which they are guilty of promoting with a wink. Media is our primary area of indoctrination outside of teaching colleges, and it remains primary in convincing teachers to stay indoctrinated after they become part of the edu-bureaucracy. But, if you consider yourself a conservative, there are even worse people -- if you will allow me to call them that -- than those who are known sinister media-types. These are the likes of Michael Medved who never lets up on the idea of winning elections at all costs. Medved cut his teeth as a Leftist. If that isn't bad enough, he was a Leftist who engaged in agit-prop during the Viet Nam war. Well, IMO, he's still doing it. No matter his protestations and books to the contrary, and his smarmy attacks on all those who justifiably worry about those in our institutions who have betrayed our nation and continue to do so, he is the quintessential wolf in sheep's clothing. He is the type who King Saul refused to believe existed at the cost of his crown and the continued existence of his country. The aim of Med-type-heads is to shake the resolve of conservatives to stand by their principle. He and a few other influence peddlers very strongly helped bring about the dismal conditions governing in California. Somewhere in our future, the truth of what I am asserting will come out. But will it be too late for our nation? It needn't be. This man and those like him are paid to broadcast for the conservative cause. He is relentless in his campaign to convince conservative voters and donors that their primary political interests lay not in promoting their principles, but in winning elections. Ronald Reagan proved, in the face of immense opposition, that speaking as a conservative actually sways minds and wins elections. He was clearly a firm believer that God helped him because he helped himself. When your society and its institutions have been thoroughly decimated, will you feel comfortable with your defense that it all happened incrementally? "What could I have done? That happened despite my party (with it's nominal conservative facade) winning periodically." At that future meeting, will you say "I never dreamed my great country would meet its demise due to my giving up to sinister forces only a little bit at a time rather than checking to see what it was I was really giving in to"? Are you going to tell your Judge that you never looked at where you made errors in the past? Or are you going to say "Yes, I did realize that I'd made mistakes. But, alas, it was too late to correct them." If it's this last one, you are sure to hear "So, you did realize you made mistakes." "Didn't it occur to you to ask for forgiveness? Didn't it occur to you to promise never to travel down that path again?" I shudder for the faithful who have to answer those last two questions. I know a few who will not be able to contain a sneer. That will be -- literally -- all He wrote darlings. We are witnessing decay of the soul because of decay of the souls. Independent radio talkshow host Michael Savage is playing with the idea of running for the U.S. Senate in 2010. He considers his home state of California to be ill-advised because the libs would leave no stone unturned to re-elect Barbara Boxer despite her otherwise unlikely chances. Although he hasn't stated it yet, he's looking for a red state that isn't afraid of having every other part of the country hating it for electing him. LMAO. Since he's planning on running as a Republican in a primary against another Republican, he's gotta figure out a way to win despite widespread GOP opposition. That would especially be true after he wins the pubbie nomination. Oh. and is there another talkshow host who wouldn't be out to frag him? The aim of AG Holder and President Obama is clearly something other than protecting Americans. Seriously. Do you recall reading here Congress is Rigging the Vote yesterday? You may want to hear it from the Wall Street Journal's John Fund instead of little old me. The first 2 plus minutes of this clip will tell you about Congress' next stab at brazenness of which I've been warning for some time, but with more authority. As I asked yesterday: What will you do? Trying to be fundamentally serious (the life you save may be your own), one of the things I have been trying to convey here is that our Left has been handicapping for the terrorists. I’m pretty sure most of you are getting the same impression. What Rickl might call “the thinking of the Left” — that’s what needs to be defeated NOW. That is needed whether or not the Left will (surely?) reappear later in another form as Teresita asserts. 2. we want them to STOP. This is not golf where we there is a need to make the game more even so that it is more enjoyable for all who play. You Western governments have not been given power to handicap our anti-terrorist forces so that the terrorists chances IMPROVE. You have been given power to protect us, not to “entertain” us. Stop wasting our resources and endangering our lives and start profiling. Janet Napolitano was prepared to profile returning vets, but not Muslims. One might get the impression that among Muslims hide her agents while our vets are her enemy. What will you do when Congress rams through federal control of voting? They'll do it like they have done with healthcare so far. They will claim they're doing it for some Leftist "altruistic" purpose, but it will be to protect themselves from our displeasure over everything they have done over the last 15-18 months. What will you do? Better to have started planning last year, but now is better than later. They are not going to come after you unless you try to prevent their implementation of the theft of your vote, which is your only real voice in how government operates. IOW, they'll have rigged it so you have to come to them to prevent them. They make the rules, and they're daring you to violate the rules they make. how do we get others to take a "no more nonsense" approach with those who've risen to power? Well, as I had just finished writing the above words, Wretchard posted again. Alan Johnson will support any request to ban a provocative march by Islamic extremists through Wootton Bassett, the town renowned for honouring Britain’s war dead. The Home Secretary reacted yesterday to mounting public anger at hate preacher Anjem Choudary’s plan to stage the stunt. Gordon Brown had earlier declared that he was ‘completely disgusted’ at the ‘abhorrent’ protest proposed by the firebrand cleric. The politicians found their backbone when the population told them to look for it or else. The lesson here is real simple. If the leaders won’t lead from the front, they’ll from the rear. The real heroes here are the organizers who got together 250,000 Facebook signatures to give Gordon Brown his Come to Jesus Moment. Organize, organize, organize. With organization comes confidence. With organization comes daring and boldness. People lose their fear. Do you know who’s feeling his gizzard churning right now? Anjem Choudary of Islam4UK. He thought he could terrify people with his bristly beard and trash talk. Well he could terrify the politicians for sure. But once the public got mobilized the tables were turned. This needs to happen all over. Then you’ll see the Muslim ladies who’ve been beaten by their husbands, the girls threatened with honor killings, the teachers who’ve been intimidated by the radicals come forward. Haltingly, blubberingly. But never mind. It’s like that scene with Walter Pigeon from “How Green Was My Valley”. Walk, child, walk. The role of the security forces is to keep the armed opposition in check. To provide the security screen for the really killing blow: the struggle of the mind. If we can free our intelligensia of the dead tyranny of Leftist ostracism and Islamist fear, who knows what they might blurt out. What I've highlighted in yellow, my friends, tells you what you can do and why you must do it. Those at the top can have backbone infused in them from the courageousness of those below. Live it. Despite all the idiocy on the Left, the Right has difficulties making headway because radio spectrum occupying consortiums like Salem Radio give prominent time slots to notoriously slow talkshow hosts. "I hadn't made the connection before that the Left both wants welfare states and smaller populations. That's contradictory! You can't maintain a welfare state without a growing population." Because he is a popular advocate of conservative values, especially Judeo-Christian morality despite his personal failings (counter-intuitively non-hypocritical), I don't like slamming the guy. Given his panicky support of TARP, this is not the first time Mr. Prager has permitted his total incompetency with regard to anything that requires some arithmetic skills (let alone simple math concepts like compound interest) get in the way of him speaking on a financial subject. More and more the blogosphere is necessary to set the record straight or to challenge "conservative" talkshow hosts before their wider access to listeners, and thus easier ability to influence, can cause damage. The Right cannot counter the Left when those who control the airwaves may have an unknown agenda that may not match the individuals they pretend to serve. By no means is Dennis Prager the worst host Salem employs, but he frequently leaves me disappointed if not temporarily demoralized. What is known as conservative talk radio should never be demoralizing, but it frequently is. Those who claim there is no God will nevertheless covet the worship mankind bestows upon Him. I suspect their anger becomes greatest when it comes to gratitude. Although gratitude is widely acknowledged as the weakest of emotions, there is no tyrant on Earth, big or small, who does not covet any small symbol of gratitude granted the God they disparage publicly as Your Invisible Friend. I've observed before the apparently brilliant balance of the Ten Commandments. The first Commandment is about wishing to be as close to God as possible: your nearest Neighbor, your surest Source of solace, of happiness. The last Commandment warns about coveting anything that is your neighbors. What surer way to convince your neighbor to distance himself from you than for you to discomfort him by openly coveting what is his? In a way, are you not actively distancing yourself from him? Then extend that thought to those that distance themselves from Him. And in a larger sense, is happiness what the covetous seeks, or is it the power to deny happiness to another? When I say there are men who deny God exists, but nevertheless make war on this God that does not exist, what I'm seeing are men who would do battle with a concept outside of their knowledge simply for the purpose of denying to Him (just in case He exists) the happiness He wishes for His Creation. Be ready to battle anti-theists and their sponsors, for they are determined to destroy any who stand by Him or defend those who do.